Enzo Life Sciences continues to expand its offering of unique Cellestial® Cellular Analysis products with the introduction of the Cyto-ID™ Red Long-Term Cell Tracer Kit. 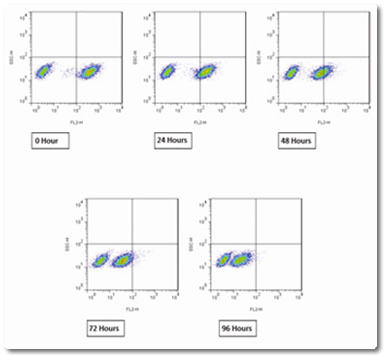 Figure 1: Flow cytometry analysis of mixed population of Jurkat cells 96 hour incubation. Unstained cells (left), stained cells (right). Using a proprietary, non-covalent, cell labeling technology, the Cyto-ID™ Red Long-Term Cell Tracer Kit provides a method for fluorescent labeling of live cells over an extended period of time. The dye is well retained by cells for up to 96 hours after loading, and is passed to daughter cells upon mitosis with decreased fluorescence intensity. The red fluorescent dye incorporates into the cell’s plasma membrane with no apparent toxic effects. Since the dye does not covalently modify proteins within the cells, normal physiological responses are well preserved. Cyto-ID™ Red Tracer Dye fluorescence is independent of pH within normally encountered physiologic ranges and fluorescence intensity per cell is typically unaffected by the ultimate pattern of dye distribution. The kit is suitable for tracing cell lineages, as well as assaying proliferation, precursor frequency, chemotaxis, migration, phagocytosis, and cell- and antibody-mediated cytotoxicity. Analysis of labeled and unlabeled cell populations over time by flow cytometry or microscopy has been validated. Like many other Enzo Life Sciences’ Cellular Analysis products, the Cyto-ID Red Long-Term Cell Tracer Kit is supplied in an easy-to-use, complete kit format. For more information on, or to order, the Cyto-ID™ Red Long-Term Cell Tracer Kit or other Enzo Life Sciences products, please visit us at www.enzolifesciences.com or call us at 1-800-942-0430. Now incorporating the skills, experience and products of ALEXIS® Biochemicals, acquired in 2007, BIOMOL® International, acquired in 2008, and ASSAY DESIGNS® and STRESSGEN® acquired in 2009, the Enzo Life Sciences brand now provides 25 years of business experience in the supply of research kits, biochemicals and biologicals “Enabling Discovery in Life Science™”.